MARTINSBURG — The Eastern Panhandle Transit Authority (EPTA) launched its new shelter program during a ribbon cutting for its first shelter at Shepherd University’s Martinsburg Center Thursday. The shelter, just outside the Martinsburg Center’s front door at 261 Aikens Center, was installed with help from Aikens Group, a Martinsburg real estate company. Representatives from Shepherd, the Martinsburg-Berkeley County Chamber of Commerce, Berkeley County Council, Martinsburg City Council, Hagerstown/Eastern Panhandle Metropolitan Planning Organization and Berkeley County Development Authority were on hand to help cut the ribbon, including Tina Combs, president and CEO of the Martinsburg-Berkeley Chamber of Commerce. According to Elaine Bartoldson, deputy director for EPTA, the organization has installed the first bus shelter next to the Shepherd University Martinsburg Center due to a high demand of ridership for that location. 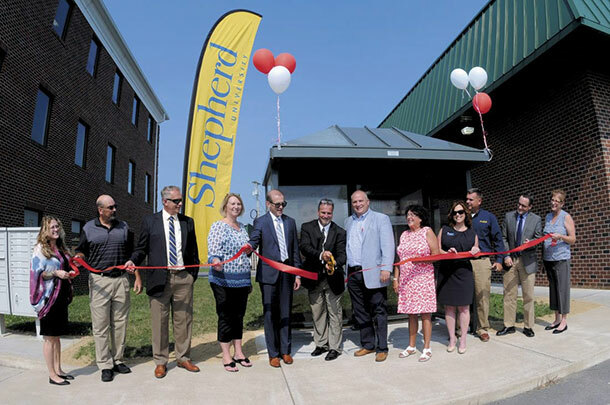 “Partnering with the Shepherd University Martinsburg Center and the Aikens Group made the installation of the shelter a reality,” Bartoldson said. Bartoldson said the bus shelters provide protection from inclement weather and make bus stops more easily identifiable to customers. Offering bus shelters for riders helps improve the commuting experience. “Ten years ago there was a grant that EPTA received where we acquired three shelters, but it has taken a long time to get this one up and running, “ Bartoldson said. Jim Klein, Shepherd University Martinsburg Center director, said he believes the partnership with EPTA and Aikens Group is strong. Doug Pixler, EPTA director, said this is the first of several shelters EPTA plans to install along its bus routes. Bartoldson agreed, stating EPTA has plans for three more shelters within the next year. Bartoldson said that EPTA is going through a route revision and hopes to expand ridership south to Inwood. Kristina Arntz, director of Aikens Group hotel sales and marketing, said she is excited on behalf of Aikens to help with this project. “Aikens financed half of the project, so we are really excited and happy to do that,” Arntz said. Michael Ferrari, vice president of the EPTA board of directors, said he is excited that EPTA has decided to expand the bus routes throughout Berkeley County. Berkeley County councilman Dan Dulyea also said he is proud of the work EPTA and their partnership are doing at this time.